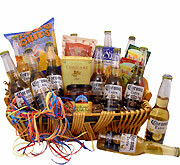 Buy your Beer Gift Baskets from the Experts in Gift Basket Delivery. Cheer for the big game. Cheer up after a heartbreak, a tragedy or an unfortunate experience. Cheer on your best friend, the best man or the best father ever. There are few things that you can count on to show up for every important moment in your life, but your favorite beer is one of those things. Whether you're toasting to your 20-year anniversary, roasting your best friend on his 21st birthday or coasting through one of the most emotional days of your life, a bottle of cold beer fits the occasion. 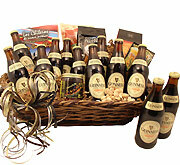 At BeerGifts.com, the mission is to make the gift of beer as convenient as possible. Whether you're traveling around the world, chasing down your first real job, romancing someone special or welcoming a new addition to the family, there are times when your body will wander from the people you love. 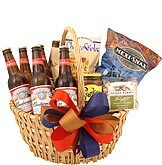 That doesn't mean that your heart and soul have to wander, and a beer basket is the perfect way to say "I'm right there with you." 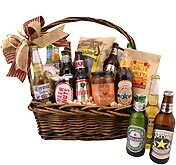 There are gift baskets for bridal showers, gift baskets for romance, gift baskets for professional acquaintances and gift baskets that say, "I'm sorry." 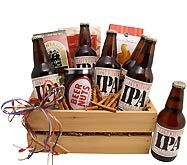 Then there are Beer Baskets suitable for everyone at any time, regardless of the occasion. 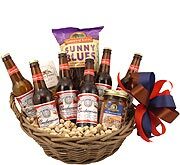 Send your lover a basket of Budweiser to get Friday night started off right. 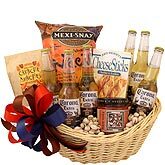 Congratulate your best friend on a job well done with an array of imports. Give your mother something to celebrate, your father a moment to remember and your sister a touch of the good times. 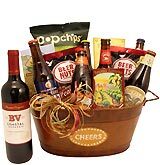 If they're of drinking age, and they appreciate the comfort that comes when the top is popped and the bottle tips up, a basket of beer and gourmet snacks will always hit the spot. 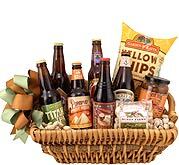 Have some fun browsing well-designed baskets filled with authentic name brand beers and gourmet-quality snacks. 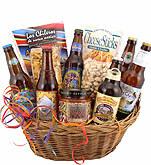 From the cheese sticks and the almonds to the pretzels and the cashews, each basket is filled to the brim with treats that complement the beer of your choice. 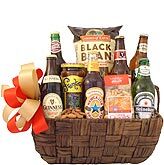 Shop in confidence, knowing that we carefully source our products to deliver fresh quality with every beer gift. 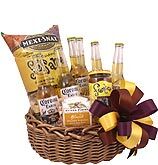 When you want to select the perfect gift to make just the right impression, our baskets will accommodate your needs. 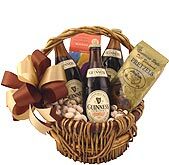 We strive to satisfy every customer, from the beer connoisseur to the occasional drinker. Here's to appreciating life's little moments and making big moments magical. Cheers to you. 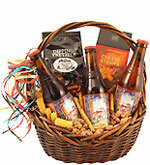 BeerGifts.com is your one-stop shop for beer gift baskets that suit every taste preference. 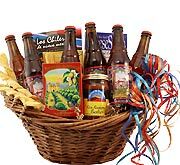 Whether you're searching for proven brands like Corona and Heineken or you want to sweeten the deal with the fruits and spices of Fat Tire, you'll find the perfect gift basket right here. 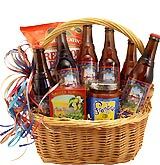 Deliver your local pub experience with a basket of microbrew or take it international with classic imported brew. Wherever your life takes you, there's always a way to reach the ones you love. Some brewers stick to traditional brewing methods to create high-quality brew, but others spend decades perfecting their own methods. These are the brewers that craft unique beers that are difficult for rivals to top and near impossible for fans to turn down. If you want to taste what one of the most innovative breweries in the world can produce, you can't go wrong with Anchor Brewing. They're the San Franciscan brewers who developed the process of kräusening and produced the popular Anchor Steam Beer as a result of that process. They combine top-quality Two-Row Pale and Caramel malts, lager yeast, Northern Brewer hops and an open-air fermentation system to create a deep amber color that speaks to the complex flavor delivered in every bottle. You can expect a generous head of creamy foam that rises to the top of your glass, and malty sweetness touched off with the tang of citrus. When you need to lighten the mood or brighten up your day, pour a tall glass of Fresh Squeezed IPA. Brewed year-round at the Deschutes Brewery in Oregon, this brew features a refreshing blend of Mosaic and Citra hops. While the grapefruit makes its presence known in the aroma and flavor, there's an overall citrusy appeal that is well blended, and that goes down smooth. It's like squeezing fresh oranges and grapefruits to create a tangy juice, but you don't have to do the work, and the alcohol content is far more rewarding. Nugget hops are thrown into the mix as well while Crystal, Munich and Pale malts put the final touch on the recipe. When you have a moment to refresh, you can expect a medium body with so much citrus that you'll want to drink a bottle with your breakfast. Consider it orange juice for the adults. Pale Ale is the beer that started it all for the Sierra Nevada Brewing Company. Ken Grossman launched the company in 1979. He tested his equipment with a stout that is still on the market today, but it wasn't until this hoppy Pale Ale was released in 1980 that Sierra Nevada started to make an impression on the beer industry. They remain one of the leading American beer brands today, and this all-natural ale continues to refresh and energize beer enthusiasts as well as occasional drinkers. It starts with an aroma of grapefruit and pine and finishes with the power of Cascade hops. Brewed with a combination of Cascade, Perle and Magnum hops and a blend of two well-chosen malts, this is the perfect beer to accompany a light summer salad. It can also lighten the load when you indulge in steak with a side of veggies. If you need proof that this is an outstanding American ale, consider the fact that it has landed the Santa Fe Brewing Company two Best of the Rockies awards as well as two medals from the North American Beer Awards. The Two-Row Pale, Crystal and Carastan malts definitely make themselves known in the aroma as well as flavor. That's okay because the Santa Fe brewers made sure that the Willamette, Cascade and Cluster hops deliver a bite that you can't overlook. This creates an amber-colored brew that you'll want to share with your friends on pizza night. Since it's just as flavorful straight out of the bottle as it is when poured into a glass, it's the perfect brew to stock your cooler for tailgating or a football party. It can balance perfectly with anything that packs a flavorful punch, so combine it with your spiciest recipe when placing it on the dinner table. Rogue Dead Guy Ale is a German Maibock style with deep honey color and a malty aroma. This style of beer is hearty in richness and well balanced at the end. Bock is a dark beer with intense flavor that is traditionally a seasonal delight, but the Gordon Biersch Brewing Company offers their Blonde Bock all year long. While many beers blend the sweetness of the malts with the bitterness of the hops, this brew allows the sweet and the bitter to coexist in harmony. The hops make an instant appearance when you take a sip, but then the mildly sweet malts take over. Each taste finishes with a blast of hops in all their citrusy glory. This creates complex flavor that contrasts with the simple glow of the yellow color. If you're a fan of creamy beers with a tall cap of foam, you may enjoy the ivory foam that rises to your glass as you pour this smooth beer. This is a good brew to sip while eating dessert, but it also works well with fried chicken and other salty dishes. Good things come out in the sunlight, and that includes Twilight Summer Ale from the Deschutes Brewery in Bend, Oregon. While the brew includes a combination of four hop varieties, it's the Amarillo hops that jump out and take the lead. Northern Brewer, Tettnang, and Cascade hops are central to the flavor profile as well, but bitterness never overtakes the sweetness that comes from Carapils, Munich, Crystal and Pale malts. Like all exceptional summer ales, you can expect to taste the citrus highlights when you relax with a glass of Twilight, and the complexity of grapefruit pairs well with the dominant hops in this light beer recipe. Add an interesting bottle label that instantly puts you in the mood for a day outdoors, and it's clear why this Deschutes beer has won 10 awards. This includes two gold medals from the U.S. Open Beer Championship and two golds from the European Beer Star. Monks' Ale follows the ages of an old tradition of monastic brewers in Europe. A lighter variation of the Belgian pale ale it is made with pilsner hops. Pairs well with the white meats and seafood and cheeses and fruits. Color is light in copper and carries the finest ingredients including three European hops, and malted barleys tat originated in Belgian and North America. Turn up the hops and put the alcohol on overdrive because the Stone Brewing Company is ready to put on a show for IPA fans. Their passionate brewers spared no expense when steeping their India Pale Ale with Azacca, Calypso, Centennial, Chinook, Ella, Magnum, Motueka and Vic Secret hops. That's a powerful combination that cranks up the hop intensity in terms of flavor as well as aroma. Even though the hops are put in check just slightly by a touch of malts, this is a brew that allows the hoppy bitterness to jump out at your nose the moment you open a bottle. You may enjoy the refreshing burst of pine, but take a good whiff to savor the hints of tropical and citrus fruits as well. The complex flavor has a fruity essence that may even please your sweet side. What else would you expect from one of America's leading IPAs? Just when you think you've found another mild wheat beer that you can enjoy on a summer afternoon, Snapshot hits you with something so tart that your lips can't help but pucker. The New Belgium Brewing Company expanded their brewing process in order to craft this unusually zingy beer. They started by combining Wheat and Pale malts with Cascade hops, but they added a new step to incorporate souring bacteria known as lactobacillus. This is what allows the beer to start out with a tender sweetness and end with a punch of sour that will make your eyes widen in excitement. Coriander is the secret ingredient for that sweet beginning, and the brewers added grains of paradise to make the final product sing. Snapshot Wheat is the kind of beer that you slowly savor, drop by drop. It delivers a light aroma of citrus fruits and pours into your glass sunshine yellow with a head of white foam. That tart quality will bring a smile to your face in the darkest of times, but it's also the recipe for a great time on a cheerful day. Pipeline Porter was inspired by the massive, curling waves of the Bonzai Pipeline and other hot surfing destinations in Oahu, Hawaii. Using their knowledge of the island and the sport, the professionals at the Kona Brewing Company set out to create a smooth beer that surfers might enjoy on the sandy shores just before paddling out in search of a big wave. The result was a rich beer that pours into your glass a deep brown, but it's just as satisfying when savored straight from the bottle. The star ingredient is Hawaiian Kona coffee, and it plays well with the Willamette and Millennium hops. Add a mix of Roasted Barley, Caramel, Chocolate and Premium Two-Row Pale malts, and you have intense flavor that mimics the rush of adrenaline that surfers experience when coming out of those impressive Hawaiian waves. This is a smooth dark brew with tons of a character. The aroma will grab your interest, and the flavor will hold you hostage to the last drop. Few breweries can say that they outlived prohibition, but that's exactly what the Anchor Brewing Company accomplished. The brewery was established in 1896 when two German brewers purchased an established saloon in San Francisco. Otto Schinkel, Jr. and his father-in-law Ernst Baruth operated their saloon for around a decade before stumbling upon setbacks that may have caused many businesses to fold. Call it bad luck, karma coming back around to bite them where it hurts, fate or simply the twists of time, but Ernst passed away, the brewery burned to the ground, and then Otto passed away in an accident, all between 1906 and 1907. All successful breweries have their sad stories of obstacles that they had to overcome and sinkholes that they had to cross to get where they are today, but few have faced multiple deaths and a devastating fire. Anchor Brewing survived those tragedies thanks to a group of German brewers and a liquor store owner who took over operations in a new location. In 1920, they were faced with a lethal bullet that no saloon could escape: prohibition. For more than a decade, Brewers had to take cover by halting operations. While it's unknown whether Anchor's brewers contributed to the bootleg market or not, it's clear that they were ready to come out swinging when prohibition ended in the early 1930s. That's a lot for one business to endure regardless of the product, but there was one more fire and another death in the works for Anchor. The company did shut its doors for a brief period of time in the 1950s due to declining sales, but they reopened in 1960. 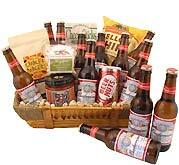 The beer industry changed dramatically from 1896 to 1960. Beer drinkers were buying mass-produced products from local stores more often than they slid onto bar stools in a saloon. The craft of brewing was changing with innovative approaches and a wider variety of ingredients, so Anchor had to step beyond their comfort zone to keep up with their competitors. They couldn't do that on their own with outdated equipment and a single recipe, but Fritz Maytag purchased more than half of the company and saved it from going under in 1965. His innovative spirit and willingness to take the business into the modern world is the reason that you can walk into a store and purchase your favorite Anchor beer today. There are now more than 10 Anchor beers on the market, and you can buy them across the country from select vendors and distributors. This includes an impressive lineup of year-round beers as well as a growing collection of seasonal flavors. Anchor Steam Beer is the original brew that got this company started, and they're still bottling it up and shipping it out today. Other favorite flavors include Go West IPA and Anchor Porter. Anchor is also well known for their Christmas Ale. Each year, they select a different type of tree to feature on the label. The label is created by a different artist each year, so the bottle changes every year. This has turned it into a collector's item, but the beer is just as popular for its flavor and aroma. The modern Anchor Brewing Company works hard to keep up with changes in the craft beer industry while fully embracing the rich history that brought them to where they are today. While they do use state-of-the-art brewing methods, they stick with a more traditional brewing process. They also use a mash made purely of malts. The blend of malt will vary depending on which beer they're making, but they don't throw in rice or other additions. Finally, they settle for nothing more than whole-cone hops. While some beers are made with cheaper extracts or pellets, Anchor works with the full cone for maximum flavor and aroma. The original Anchor Brewers would have never cut corners in the pre-prohibition days, and this is one brewing company that lives up to its roots. A lot of great things are born on the internet, and you can now add the Flying Fish Brewing Company to that list. Gene Muller attended classes at Chicago's Siebel Institute of Technology because he wanted to learn how to craft well-balanced, highly drinkable beers bursting with flavor, but he also had dreams of offering his unique beers to the world. Rather than following the traditional path of opening up a brick and mortar brewery and trying to get locals to fill the tasting room, he turned to the internet. Gene created a website that allowed him to accept orders from beer lovers all over the country. This was a genius idea that gained a lot of attention from investors because he was the only online microbrewery in existence. With money from his investors in hand, he turned his website into an interactive product that engaged fans interested in seeing what it takes to establish a successful brewery. The website allowed people from around the world to see behind the scenes as he opened his first offline brewery in 1996. They were even allowed to help make decorative decisions for the brewery. You could say that Gene Muller grew accustomed to being first because he moved from the first online microbrewery to the first microbrewery in southern New Jersey. The Flying Fish brewery is now located in Somerdale, New Jersey, and is a state-of-the-art facility with triple the capacity of the original brewery. This is one of the largest breweries in the state, and they've produced many award-winning brews. They've even won at least 10 medals from the Great American Beer Festival. It's easy to think about the Flying Fish Brewing Company as on online brewery, but the company's accomplishments in the real world are far more impressive. In addition to operating a highly successful brewery and crafting beers that are served in restaurants throughout New Jersey, the brewery is also connected to a high-class restaurant known as the Flying Fish Crafthouse. The restaurant serves fresh meals paired with small-batch releases of Flying Fish beers. This is the perfect fit because Flying Fish brewers strive to create beers that are easy to drink and that complement the fresh flavors experienced on the plate. They want their fans to drink up and enjoy, but they also want them to complete the experience with a well-matched meal or a buffet of tasty snacks. The quality that they put into every batch of beer is designed to do more than get you drunk. They want you to enjoy Flying Fish beers for the experience rather than the intoxicating effect. What's on the Flying Fish Menu? The Flying Fish Brewing Company doesn't offer the largest collection of beers, but they make up for the variety in taste and quality. They now offer a few year-round beers, a small collection of seasonal flavors and a specialty line known as the Exit Series. The year-round lineup includes a variety of brewing styles, ensuring that most beer drinkers can find something that meets their drinking style. If you don't like their Extra Pale Ale, you may enjoy a tall glass of Hopfish IPA or Redfish. When the cold weather sweeps across Jersey and the rest of the United States, start looking for Grand Cru Winter Reserve on the shelves. When the warm weather makes a comeback, it's time for Farmhouse Summer Ale. When you want to celebrate in October, you can't go wrong with a bottle of OktoberFish. You might even want to grab an oversized bottle from the Exit Series to celebrate New Jersey. Remember, Flying Fish beers are highly drinkable and well balanced. While you'll taste the hops and indulge in the sweet malts, you won't find beers that put a spotlight on one ingredient. Those hops and malts are brewed to complement rather than compete with one another. If it weren't for experimentation and the innovative spirit of often-unrecognized brewers, you wouldn't have a smorgasbord of creative labels and complex flavors waiting for you at your favorite store. Intense aromas wouldn't drift out of the bottle, threatening intoxication before you take the first sip. You probably wouldn't know anything about gose and other brewing styles that have gone out of fashion over the years. Most people would still think of beer as having one unoriginal flavor, and you would drink to get drunk rather than for the sheer pleasure of the experience. One brewery that has played an active part in bringing the beer world to life is the Anderson Valley Brewing Company. The brewery first opened in 1987 in Boonville, California, and is now one of the longest-running brew companies in the United States. Like the 20 or so competing breweries that were in operation at that time, they started out with a small brewhouse that contained 10 barrels. This brewhouse was located in the Buckhorn Saloon, and local consumer demand for Anderson Valley beer grew quickly. The Anderson Valley Brewing Company eventually moved to a larger brewhouse with 100 barrels, which was located down the street from the Buckhorn Saloon. The new site contained a disc golf course, a tasting room, and a beer garden, inviting visitors to hang around and have some fun while enjoying an expanding lineup of craft beers. This is where this pioneer brewing company remains today, and they spend a great deal of time innovating more complex flavors and sourcing creative ingredients while perfecting brewing forms that are no longer common. One of their most unique flavors is an orange ale that they call Blood Orange Gose. There weren't many competing breweries offering gose before the Anderson Brewing Company introduced their first canned gose in 2014. This is a German-style wheat brew hat is both salty and tart. It took months of testing and reworking the recipe to create an authentic gose, and that original contribution kicked off a growing interest in traditional gose brews. This brewing company also showed their innovative spirit when they started their Barl Series. These beers were born from a collaboration with Wild Turkey, and the line features barrel-aged beers infused with bourbon. If you prefer to mix your beer with wine, Anderson Valley also offers barrel-aged wine sours. From their Fall Hornin' Pumpkin Ale and their Spring Hornin' IPA to their Summer Solstice and their Winter Solstice, this brewery has a growing lineup of seasonal releases as well. You may also want to try some of their specialty lines, like the innovative Wild Turkey Barl Series of bourbon-infused beers or flavors from the Mendonesia Series, which are brewed in small batches only. As if the innovative spirit of the Anderson Valley brewers and the intense flavors of their beers weren't enough, this brewery gives you one more great reason to drink their brew: sustainable brewing practices. All spent hops and grains are recycled and put to good use rather than thrown out. All waste water created by the brewing process is purified and reused. The brewery even features solar panels that reduce their energy consumption by at least 40 percent. If you want to say that you're drinking for a good cause, give the Anderson Valley Brewing Company your business. It's common for successful breweries to come from the connection between a talented businessperson and a passionate brewer. One contains the business experience and marketing expertise needed to establish and grow a stable business while the other brings the passion and technical knowledge required to produce an award-winning beer that fills bar stools and demands mass shipments to thirsty fans. This arrangement has helped many talented brewers develop profitable businesses, and it's exactly what worked for the founders of the Gordon Biersch Brewing Company. It started when Dan Gordon completed his studies at the prestigious Technical University of Munich and started searching for a trustworthy, talented partner with a business mind. His skills and tastes as a creative brewer had created a growing demand for his fresh beer recipes, and he wanted to fill that demand by opening up a brewery. At the same time, an experienced restaurateur named Dean Biersch was searching for a business partner interested in opening up a brewery restaurant. His goal was to put the spotlight on a high-quality beer label while serving delicious food to match. When he was introduced to Dan Gordon, their ambitions collided and sparks flew. Their visions lined up, and they quickly set out to establish a brew restaurant in Palo Alto. 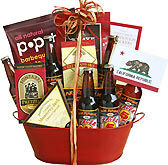 The first Gordon Biersch Brewery Restaurant was established in 1988, and the company's San Jose brewing and bottling company was opened in 1997. Dean and Dan started out with a well-designed restaurant and a small selection of authentic German lagers, but they now run a successful business with a state-of-the-art brewery and their own bottling business. They're also known for setting the bar quite high when it comes to standards of quality. Any successful brewer will tell you that quality ingredients are critical in today's craft beer market, but few can match the standards that are set for every brewer working with the Gordon Biersch Brewing Company. The company only creates authentic German ales and lagers, and they follow the German Beer Purity Law to ensure that every batch is consistently fresh and potent. This law is also known as Reinheitsgebot, and it requires brewers to follow a strict set of rules, regulations and test protocols to ensure exceptional quality. Part of this law is the use of all-natural ingredients that are always fresh. This is why you'll never see chemicals or additives on the list of ingredients when you're drinking a bottle of Gordon Biersch beer. Even the carbonation process is completely natural. The Gordon Biersch Brewing Company currently offers around 10 beer flavors. While they all offer their own flavor profile and have something unique that makes them intriguing, they're all authentic representations of traditional German lagers and ales. They also use the finest quality hops and malts, and even the water used to bring each batch to life is carefully sourced. Some Gordon Biersch beers were inspired by connections with other businesses and organizations. For instance, their Chum was designed due to a partnership between the brewery and the San Jose Sharks. The brewery is also known to craft year-round beers and seasonal beers of similar styles, each offering something unique. For instance, their Blonde Bock is a year-round offering that is often associated with the seasonal bocks released by Gordon Biersch in the spring and winter. These connections are often the reason beer fanatics spend time looking for seasonal and specialty releases from this brewery. While the Gordon Biersch Brewing Company does limit their production to German beers, the brews that they contribute to the current craft brew scene are exceptional. When you wish that you were in Germany, pick up a bottle of Gordon Biersch.